Welcome and thank you for visiting my website. Currently home to my first novel “Merging Lives” and it’s movie treatment. Soon I will include “connected Souls” the next book I’m working on. Enjoy, and if I can answer any questions feel free to email me. 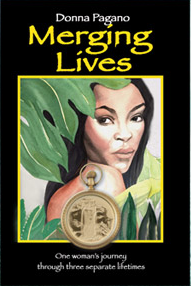 Merging lives is the story of one woman’s soul journey through three different lifetimes. Her name is Pama in her slave lifetime, Jigonsassee in her Huron Indian lifetime and Mariah in the present day. She is a mystic woman with deep insights yet she has life lessons to conquer, like we all do. Pama encounters the horrors of slavery and the heartache of unimaginable loss, Jigonsasse experiences the conflict of unrequited love, Mariah faces manipulation by controlling lovers. Each woman has lived in vastly different parts of the world — in different centuries and under completely different circumstances. Or are they so far apart after all? The women are in fact, one and the same spirit. Over time that spirit has grown stronger, wiser and more insightful. A higher love, an enriching peace, the perfect balance of serenity and delight await her soul, once she is finally willing and able to open her eyes to the true purpose of each and every lifetime on earth.